Nearly everyone I know who smokes asked me about bringing back Cuban cigars. Cuba is known for their excellent cigars. Is it just the allure of something we can't get in the USA? (because if there is one thing Americans are known for its for getting what we want as long as we can pay for it! ) Or are the cigars really that good? Our exchange wasn't centered around cigars but several of the men and a woman on our trip had interest in Cuban cigars, so our guides made sure they were able to explore their interests by recommending cigar bars and shops where they could buy them, during free time when there weren't exchange activities planned. We were told that all the Cuban cigars are made by the government factories, that these same factories produce all of the different "brands" of Cuban cigars. We were also told that the reason for the superiority of the cigars is due to the care taken to get the best leaves, with no stems or flavorless by products, and that they are all rolled by hand. Those folks who tried them did say the cigars were superior to what they can normally buy in the US, and several occasional smokers were feeling the effects of overindulging in them after a day of two. One thing I noticed as a non smoker, is that in the US, cigar smoke is intolerable to me, it will drive me right out of a venue. But in Havana, even a room filled with smoke from Cuban cigars did not affect me the same way. Now, I know even less about cigars than cars (at least I actually USE a car in my every day life. (See our post about the cars of Cuba here; http://www.goseeittravel.com/travel-blog/2015/7/9/cuba-cars-and-cigars ) but I had the feeling that that better cigars somehow smelled better, and therefore were more tolerable to a person like myself who doesn't like them at all. I had also fixed my attitude to expect cigar smoke because it is part of the culture here, and like a lot of things in Cuba I may not agree with- I was not visiting to express my disapproval, but rather learn about the place and its culture. A haze of cigar smoke fills the Jazz club in our hotel. Smokers enjoyed the opportunity to enjoy a cigar and hear good music. One of the things visiting cigar smokers enjoy about Havana is an open culture of cigar smoking. It's welcome in many restaurants, and public places. Most places allow cigar smoking indoors and out. It's a common sight to see ash trays on restaurant tables and in the tables in the lobby of hotels. We visited some famous jazz and dance clubs and recording studios used by Cuban musicians as part of our exchange. I was unfortunately just getting over a respiratory illness and had several attacks of reactive airways while in those closed in environments, even though no one was smoking during our visits. The air quality in many places was poor and would be challenging for anyone with respiratory problems. I was fortunate to recover quickly from my issues by stepping outside and using an inhaler. Many state owned restaurants and Jazz Clubs catering to tourists do not allow indoor smoking at all. So it's possible for tourists to seek those out, but possibly at the expense of visiting with locals. 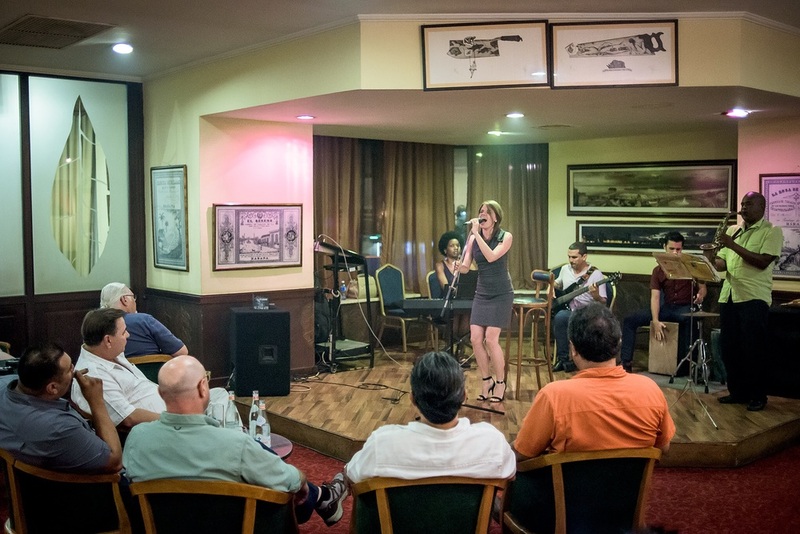 The Jazz club right across from the Melia Cohiba hotel in Vedado was airy, air conditioned and non smoking. Even though the band was local, we had met them earlier in the week as part of our exchange, the club was also filled entirely with South American and European tourists. Interestingly, we rarely saw people smoking cigarettes in Cuba. We were told that filtered cigarettes are expensive and most Cubans can get inexpensive cigars (or roll their own) that are made with the twigs and other by products of the tobacco left over from government manufactured cigars. We were also told not to buy cigars on the street from Cubans because these are most likely the home rolled versions of poor quality because ordinary Cubans do not have access to the best tobacco. There are several state run tobacco shops, and there was a shop in our hotel run by the state where all the brands were available for purchase. At the time we traveled Americans returning the U.S. were allowed to bring back $100 worth of cigars. (Any Cuban rum brought home was also included in this $100 allowance) However, our guides explained that those guidelines can change quickly and capriciously, as the tango of opening US and Cuba relations goes on, so if you go, ask someone in the know before you invest in cigars to bring home. Gentlemen in Havana enjoy a cigar while reading the two government produced newspapers.